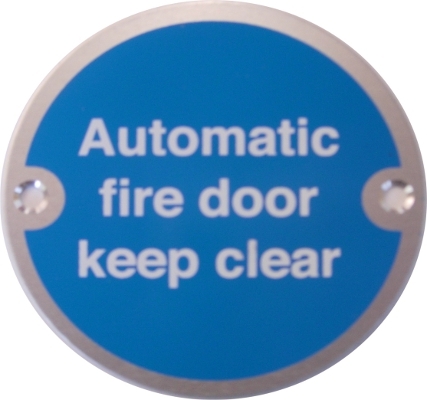 Our 76mm diameter Automatic Fire Door Keep Clear sign will compliment all interiors with a material choice of anodised aluminium, satin stainless steel, polished stainless steel or polished brass. They come with Helvetica white text on blue backgrounds which comply to BS 5499 standard and are individually packed complete with fixing screws. Buy from the trade at trade prices. Quantities over 50: discount available upon request. Click through to next page to select material. 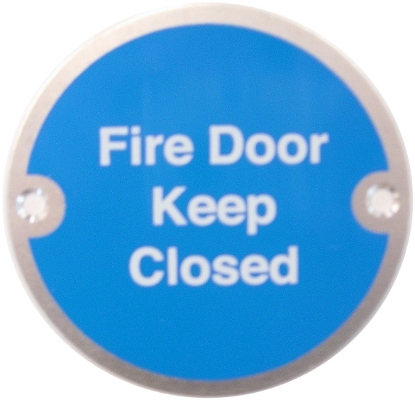 Our 76mm diameter Fire Door Keep Closed sign will compliment all interiors with a material choice of anodised aluminium, satin stainless steel, polished stainless steel or polished brass. 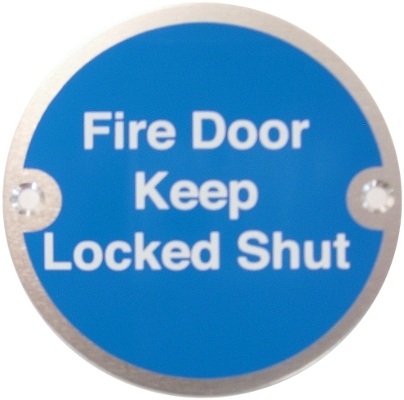 Our 76mm diameter, Fire Door Keep Locked sign will compliment all interiors with a material choice of anodised aluminium, satin stainless steel, polished stainless steel or polished brass. 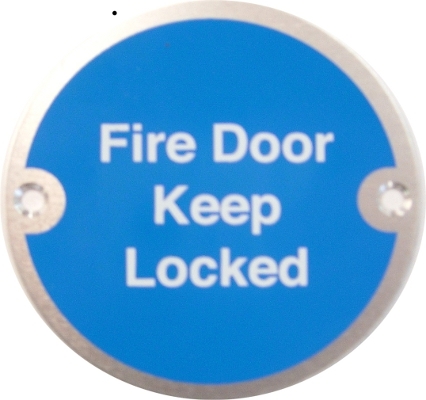 Our 76mm diameter Fire Door Keep Locked Shut sign will compliment all interiors with a material choice of anodised aluminium, satin stainless steel, polished stainless steel or polished brass. Quantities over 50: discount available upon request. Please click through to next page to select material. Our 76mm diameter Fire Door Keep Shut sign will compliment all interiors with a material choice of anodised aluminium, satin stainless steel, polished stainless steel or polished brass. They come with Helvetica white text on blue backgrounds, which comply to BS 5499 standard and are individually packed, complete with fixings screws. 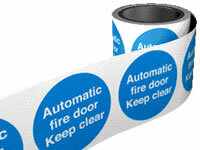 Self adhesive roll of labels - Automatic Fire Door Keep Clear 100 labels per roll. Each label 100mm x 100mm. 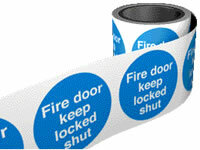 A roll of self adhesive labels - Fire Door Keep Locked Shut, 100 per roll. 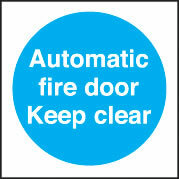 Each label 100mm x 100mm.